You know….the former Rangers keeper who was brushed aside by Ally McCoist for the likes of Steve Simonsen & Lee Robinson. After spending a couple of seasons with Hearts, he was finally given the chance to be a number one goalkeeper for the last half of the 2015-16 season with Alloa Athletic. It was not an enviable position to be in, but it was an opportunity to prove his worth. Alloa was the worst team in the Scottish Championship last season & had the worst defence in the league. They allowed 542 shots, which was 101 more then the next worst team (Morton). The Wasps’ Expected Goals Against total for the season was 62.9, the next worst team was Morton again with 47.6. Their actual goals allowed was 67, which was only one more then Dumbarton. Dumbarton’s keepers faced 35 less shots on target then Alloa’s three keepers that saw playing time last season. What (or who) made the difference in goals allowed so narrow between the league’s two bottom dwellers? The Wasps first two attempts at finding a capable goalie ended up being flops. Andy McNeil saved 68% of the shots on target that he faced, David Crawford only saved 62%. Gallacher? 75%. 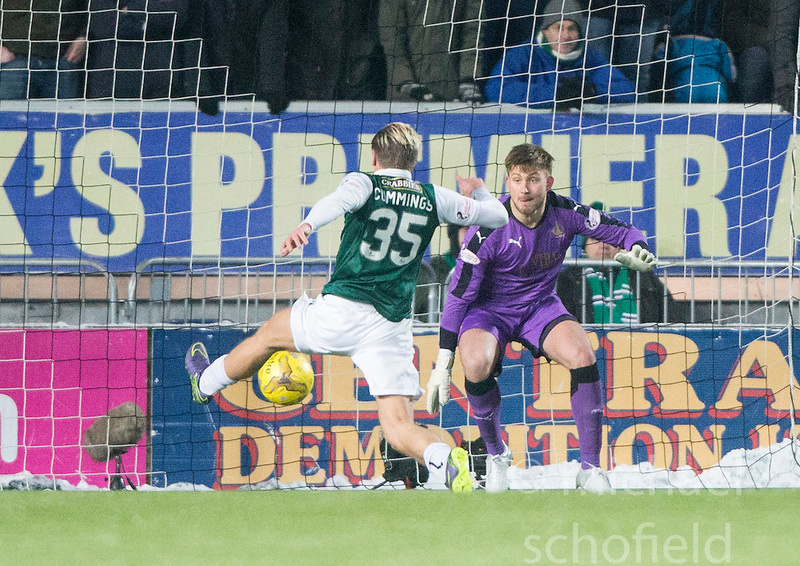 In fact, Gallacher had the fourth best save percentage in the Championship of keepers who played at least 700 minutes, trailing only Grant Adam, Danny Rogers & Derek Gaston. Wait a second…Grant Adam? Isn’t that Charlie Adam’s brother? Why yes it is. Another former Rangers keeper played extremely well in his limited minutes for Morton last season before he signed with Cowdenbeath in January. He has since signed with Forfar Athletic. Meanwhile, Scott Gallacher is currently without a team after seeing his contract expire with Alloa. So who was the best goalie in the Championship last season? Most of the data will suggest Falkirk’s Danny Rogers, who was on loan from Aberdeen. While some of the stats will suggest that you could make an argument for Gallacher – despite playing for the worst team in the league. Also, keepers like Adam, Gaston & Livingston’s Marc McCallum weren’t that far behind. What about Wes Foderingham, or even Mark Oxley? Well, the numbers aren’t necessarily on their side. Let’s begin with save percentage. Now, I am hesitant to begin with this stat because as Sam Gregory, Bill Reno, & others have pointed out – save percentage isn’t the most reliable measure of how good a goalie is. As Gregory pointed out, sometimes a team’s defence & the systems in which they play can have a bigger factor on save percentage then the actual goalie. Some teams put major emphasis on winning the ball back—Barcelona under Pep Guardiola made it their priority to win the ball back within five seconds of conceding possession. Other teams minimize the number of shots they concede by playing a high defensive line and trying to catch opposing forwards offside. This strategy of playing an “offside trap” prioritizes lowering the number of shots the opposition takes while accepting that the quality of shots will likely be quite high. Tottenham under Andre Villas-Boas played a high defensive line and as a result gave up very few shots, but the ones they did give up were often breakaways or fast breaks. Now consider the role of the Tottenham keeper Hugo Lloris. The Frenchman didn’t face a lot of shots when playing for Tottenham under Villas-Boas because the high line caught a lot of opposing strikers offside. However, the shots he did face were of a very high quality and he had a below league average save percentage. Was this a reflection of Lloris’ ability as a goalkeeper? Of course not—it was a reflection of the system. Also, save percentage tends to fluctuate from season to season, so take the following data with a grain of salt. Now, as Gregory pointed out – you cannot judge this group simply based on save percentage. Every save is not created equal. For example, 49% of the shots on target that Wes Foderingham faced were from from outside of the box. That was the highest rate in the league. Meanwhile, only 31% of Danny Rogers save attempts came on shots outside the box. That makes you look at those save percentages a little differently, right? Below you’ll see each goalkeeper’s save percentage in relation to the difficulty of the saves that they were forced to save. This difficulty is represented by the average Expected Goals value per shot on target that the goalie faced. Note that these Expected Goals totals are based on shots on target only, not every shot attempt. The objective is to put a value on the shots that goalies were forced to save, not the ones they watched go astray. Minimum of 700 minutes played. Own goals & penalty shots are not factored in. You can see why Danny Rogers was the choice for the Scottish Championship team of the year & highlights a need for Falkirk to improve their back four next season if they want to finally gain promotion. The majority of Rogers’ saves came from High Danger or Very High Danger shots (shots in the heart of the penalty area – from the goal line out to the edge of the box). Only St. Mirren (54%) allowed a higher rate of their shots from this area than Falkirk – who were tied with Hibs & Raith Rovers (52%). In comparison, 40% of the shots that Rangers allowed came from High/Very High Danger shot locations. Ultimately, you can see that Grant Adam’s save percentage was “easier” to achieve than Danny Rogers’. In fact, no keeper had a lower Expected Goal per shot faced rate then Adam. Would he have saved 81% of his shots faced if he had Andy McNeil’s defence in front of him? Probably not. the only keepers that came close to Rogers’ results were Scott Gallacher, St. Mirren’s Jamie Langfield, & Raith’s Keith Cuthbert. Like we mentioned before, this came down to the types of saves that they were forced to make. While Mark Oxley’s league low save percentage wasn’t all his fault – at some point goalies need to earn their keep. Notice that the difficulty of shots that Oxley faced was nearly identical to Danny Rogers – while their save percentages are polar opposites. Of the grouping of keepers in the Goalie & defence working together category – Wes Foderingham had the lowest save percentage. That despite seeing ‘easier’ shots to save then the rest of the group (besides Adam). Part of this comes down to a low save percentage on shots coming from outside of the box. Foderingham save percentage on these shots was 0.804, while the league average was 0.838. How much of that is on the goalie, or how much of that is luck? Typically it takes a perfectly placed shot from the heavens to beat a goalie from outside of the box. Foderingham’s results reminds me of a theory that is prevalent in ice hockey – that a goalie gets better as they are forced to make more saves, while goalies who face less are more prone to have a lower save percentage. Obviously, these are two different sports where goalies are routinely asked to make 25-30 saves in a game, while the average Scottish Championship goalie was called upon to make 4.3 saves a game. In fact, Foderingham only faced 2.97 shots on target per match. Only Mark Oxley faced less action with 2.5 saves to make a game. Both of them had save percentages in the bottom half of the table, but led their teams to the top two places in the league table? While the correlation isn’t as clear as it is in the NHL, there is some degree of a pattern being formed. Below you can see the impact that the volume of shots faced has on keepers save percentage – both in the Scottish Championship & also in the English Premier League (stats courtesy of Fox Sports). Again, 700 minute is the cutoff. In the EPL last season, only four keepers (14%) faced more then the league average of 4.24 shots on target & had a below average save percentage. In the Scottish Championship it was three (20%). Conversely, eleven (38%) goalies that saw more then the average number of shots on target in the EPL had an above average save %. Six keepers (40%) in the Scottish Championship saw a high rate of shots & had a better than average save rate. So not a direct pattern, rather we see hints of a pattern. Wes Foderingham & Mark Oxley’s save attempts per 90 are on par with Maarten Steklenburg & Joe Hart. Oxley’s save percentage was nearly identical to Steklenburg’s (0.608), while Foderingham’s was actually quite better than Hart’s (0.660). Of course, Hart & Steklenburg are facing slightly more dangerous shooters than Oxley & Foderingham. So, should a somewhat low save percentage be worrying for Wes Foderingham? Do Hibs need an upgrade in goal in order to enhance their odds of promotion? Rather then call it xSV% – I’m going to label the results: Save Percentage minus Expected Save Percentage. Again, the same cast & crew at the top & bottom of this graph. Oxley’s results are beginning to really stick out as he is grouped with keepers from the three worst teams in the Championship last season. While, Foderingham’s save percentage (average, as it was) is actually nearly equal to his Expected Save % (-0.007). 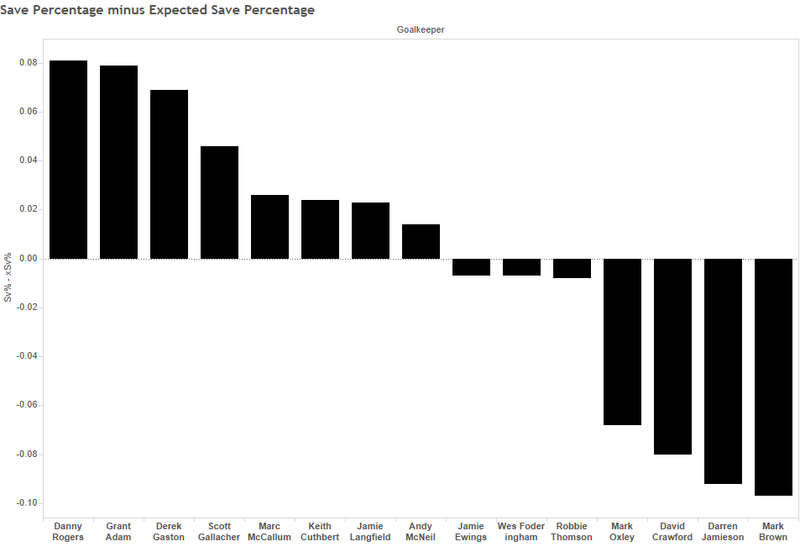 Meanwhile, Rogers, Adam, Gaston & Gallacher all had save percentages higher then their Expected %. Let’s move away from save percentages all together for our last metric. One statistical measure that we’ve used all season long is Goals minus Expected Goals (GmxG). Basically, how many more (or less) goals is a keeper allowing than he should be. I first saw Bill Reno apply this stat when evaluating Major League Soccer goalies for American Soccer Analysis. GmxG looks at where shots are taken, calculating the likelihood of a shot going in from that distance and angle to goal, which ends up telling us if a goalkeeper is giving up too many goals given the circumstances. This is great for a couple of reasons, the main one being that we have a more accurate reading on shots on goal than the ol’ shot percentage. If one goalkeeper consistently sees shots from distance while another is routinely left out to dry by his defense, the GmxG will let us know how many goals each goalkeeper should be conceding even if their SOG and goals are similar. There are limitations to this statistic, which Reno outlines here, mainly that it only measures a keeper’s ability to stop shots & does not measure his ability to handle crosses or distribute the ball. There are others, most notably Sam Jackson, who are using data to measure these skills – but Scottish football is totally lacking any kind of statistics beyond shots & goals allowed. That’s all we have to play around with. I decided to present this data in the form of per 90 minutes average to get a real sense of which goalies were having the biggest impact on a game’s results. For example, Scott Gallacher played about 1,800 less minutes than Danny Rogers. If you only looked at Gallacher’s overall totals, he wouldn’t come close to the same results as other keepers. But when you break his numbers down to the averages – you can really see his impact. Given the shots on target that he faced, Gallacher’s Expected Goals against per 90 minutes was a league high 2.49. He was getting little to no help from a defence was – as we pointed out earlier – really, really bad. Even though Gallacher allowed an average of 1.82 goals per 90 minutes, you can see that it really should have been worse. 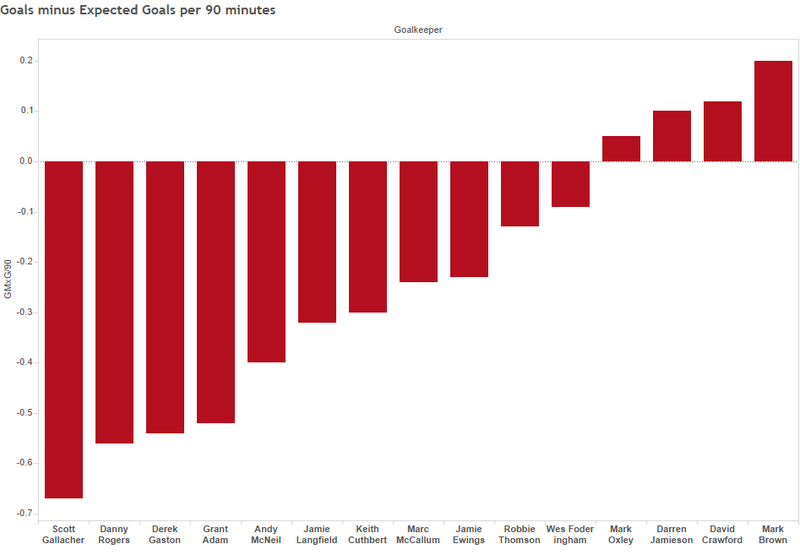 Again, Expected Goals only factor in Shots on Target when looking at goalkeepers. Gallacher, who is currently without a team, deserves a chance to be a starter somewhere this season & it would be interesting to see how he would preform with an improved defence in front of him. He’s been among the top performers in each metric presented & has been tabbed by others as deserving a chance. Along with Gallacher, we keep seeing the same names at the top & bottom of each statistical measure. The top three throughout have been Danny Rogers, Derek Gaston, & Scott Gallacher. Each of those goalies was good for preserving half a goal per game. In a league that saw teams average 1.3 goals scored per 90 minutes – that is huge! Rangers supporters: Wes Foderingham did what was expected of him – in terms of save percentage & goals allowed. His shot stopping ability was on par with the average keepers in the league. His ball distribution was probably the best in the league, while he was likekly below average in controlling the goal area (even though we have no real data to support that claim). He’s earned the right to be Rangers number one next season….but clearly there is a need to sign a back-up that can legitimately challenge the 25-year old for minutes next season.